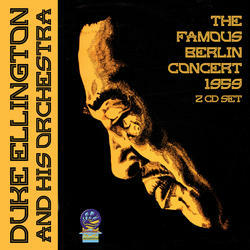 (2-CD set) These CD's features Duke Ellington Orchestra performing “live” during their famous 1959 Berlin Concert. The Orchestra includes a mass of talent with most of Ellington’s top luminaries including Johnny Hodges, William “Cat” Anderson, Clark Terry, Ray Nance, Harry Carney and others including the “Duke” on piano. Lil Geenwood provides the vocals and Jimmy Johnson is the drummer on Ellington’s show stopping feature “Skin Deep.” these discs feature the classic Ellington numbers and to the uninitiated this is a fine introduction to the “Duke” and his music.